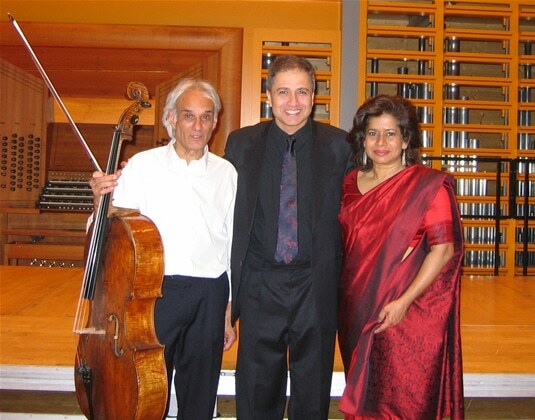 This cycle of four settings of Tagore poetry was composed at the request of cellist Rohan de Saram in 1997. The four poems are selected for their variety of feeling and rhythmic pace. Together they form a small portrait of Tagore. This performance above is of the 2nd, 3rd and 4th songs. When I was asked by cellist Rohan de Saram to compose a song cycle for Soprano and Cello, he was very specific that he wanted it to be based on the work of an Indian poet. Tagore has had a great influence on me since my childhood, and so it was natural to turn to him for inspiration. I chose these four Tagore poems to try to create a balanced cycle. There is one love poem, one about nature, one somewhat political and one for children. All of the poems have an immensely attractive rhythmic gait, and are varied in tone and pace. In Unending Love, I was drawn particularly to the lengthy lines of each verse. But long lines are difficult to ‘set’. They demand rather special care as the extended stretches of melody must also carry forward the meaning, respect the punctuation and give expression to the inner compulsion of the text, whilst still maintaining clarity and drive in the purely musical and harmonic rhetoric, so that the line does not slump or drag. All this must happen in the course of each 5-line verse, which in the case of verses 2 and 4 contains a full-stop only at the very end of the verse. So the melody must accommodate a long stretch of meaning, semantically and musically. l found that challenging (in a positive way) and interesting to deal with, as I composed the melody. These settings for solo cello and voice allowed me to write pure two-part counterpoint, as the voice and the cello lines entwine around each other in a tender and sometimes dramatic union. Simplicity was at the heart of these songs, and their modality hovers around Modes of Limited Transposition, (terminology from Messiaen) – especially an octatonic scale that is completely symmetrical and unlike a major or minor scale, being a succession of consecutive major and minor seconds. The intervals of the seconds thus feature throughout, and are especially friendly and gentle intervals, easy to sing and to draw out long lines in, without losing comprehensibility. Tagore has the extraordinary ability to take the simplest of things and link it to something profound. His nature poem here, Palm-tree becomes almost metaphysical in reach as the words conjure up a mother-child theme. The cello must conjure up a wind and then a storm that the soprano must ride, as she rises with the tree towards the stars. The third song Grandfather’s Holiday is quite disjunct in intervallic use, to reflect the playful spirit of the poem. Some of the rhythms form a kind of nursery patter which I have retained in the setting. The last song New Birth is serious in tone, and its politics and humanity were very close to Tagore’s spirit and social conscience. It seemed the most appropriate song to end the cycle with, and the intense counterpoint between voice and cello underlines its intensity of mood and message. Undergrowth, pârul-bushes, life without care. Child prancing, river dancing, waves running wild. Your laugh the sweetest music I shall ever play. Your delight the country where my freedom lies. Bringing white siuli-flowers to grace your holiday. Blown from Himâlaya on the breeze of your delight. Dressed in the colours of a grandchild’s fun. Work gone, books flying, avalanche of papers. Hurricane of freedom in my heart as you jump. You’re the one who teaches me to let myself go. To the path of your coming. What seat has been prepared for you? In the quest for the sacred in humankind? Have you heard before coming? A place of meeting and pilgrimage? Of the triumph of some great striving? Like an imminent star of morning. They seem to promise deliverance, light, dawn. The music had a quiet sumptuousness, the vocal lines beautifully drawn out, the accompaniment sweetly harmonious, de Saram’s double-stopping as mellifluous as the singing.